Phone calls, texting, apps, and getting information like the weather are a breeze because everything is accessible through the seven-inch color touchscreen. Opt for the comprehensive navigation system that displays visuals like maps and landmarks, along with turn-by-turn directions on the touchscreen. Now they’ve thought of everything! A built-in mount for your GoPro lets you capture all your adventures from the perfect viewpoint. No cable? No worries! With the available nonslip wireless charging pad, your Qi-compatible device can charge by just sitting on top of the pad. Technology features found inside the Toyota Tacoma not only make your commute more convenient, but safer as well. Its integrated backup camera with rear parking sonar help you see what is behind the vehicle, so you can safely backup without worry. The available Blind Spot Monitor helps to detect if there is a vehicle located in your blind spot and alerts you not to merge. It’s not justs technology that’s state-of-the-art. The Toyota Tacoma interior and Toyota Tacoma specs combine features designed to get work done while having fun. It’s just what people are looking for in Knoxville and Sevierville. 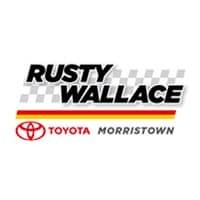 Visit Rusty Wallace Toyota in Morristown today to take a test drive. Find out how the Tacoma compares to segment rivals such as the Chevy Colorado or the Honda Ridgeline.